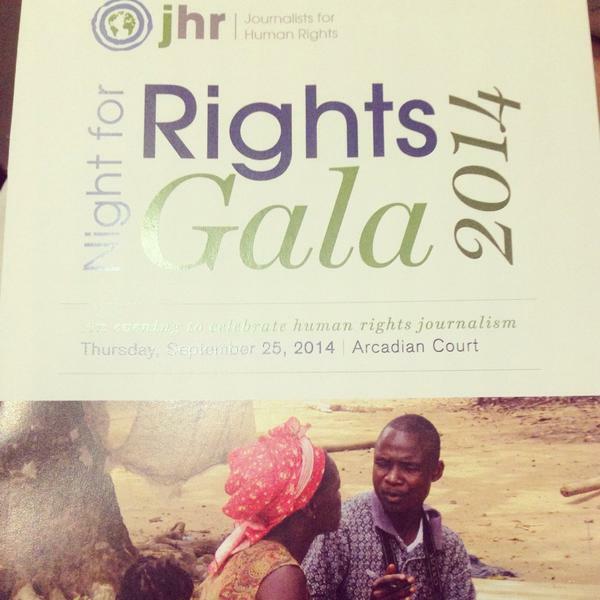 jhr (Journalists for Human Rights) | Mobilizing Media. Changing Lives. jhr (Journalists for Human Rights) works with the media worldwide to ensure every human is aware of their rights. 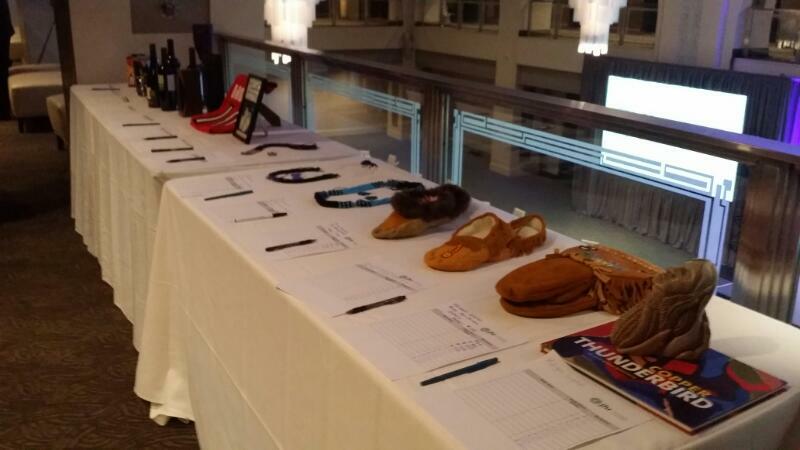 One of the fundraising ideas is the silent auction going on all evening, including art, alcohol, and Stevie wonder tickets among many other items. We can wait to see you tonight for #Night4Rights! Buy tickets at the door. 9:30 at Arcadian Court. Be there, or be square. The host for the night is Reshmi Nair, who is a first-generation Canadian. Her parents emigrated from Kerala, India. She has worked at News 1130 in Vancouver, CTV British Columbia, and CTV Toronto. She joined the CBC in 2009 to launch Connect with Mark Kelley. JHR Executive Director Danny Glenwright recounts difficulties of starting out. There were times when they had to publish with unreliable electricity. Still they helped other journalists on the ground to gain the skills needed to report issues in their community. When Ryerson University opened a JHR chapter there, the first thing they did was hold a bake sale to send recorders to Ghana. My first Hill event 10yrs ago was for Journalists for Human Rights. Nice to see how far they've come. Plus @reshminair as MC! 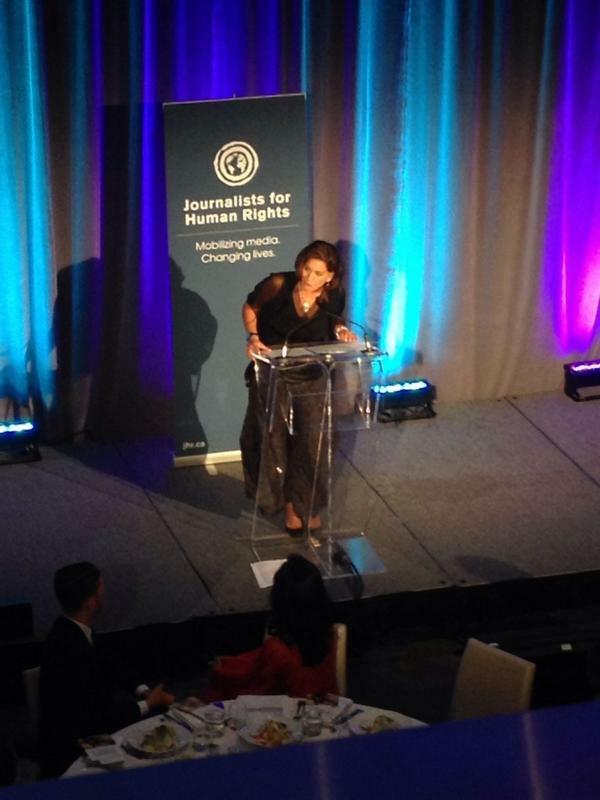 JHR's ED @dglenwright reading letter from a journalist in Sierra Leone at #Night4Rights: "Of course Im covering Ebola.. "
Lisa LaFlamme takes the stage talking about the importance of free press and democracy. "This is a right," she says. "Right now there are people sleeping in the newsroom in the Congo and many other places because it's too dangerous for them to work from home," says LaFlamme. "I learned first-hand the important relationship between Canadian journalists training African journalists." LaFlamme says with every international threat, JHR becomes more and more important to educate the public and report stories from the ground. Masai Ujuri, the general manager of the Toronto Raptors, impressed LaFlamme when he called attention to the hundreds of schoolgirls missing in Nigeria. 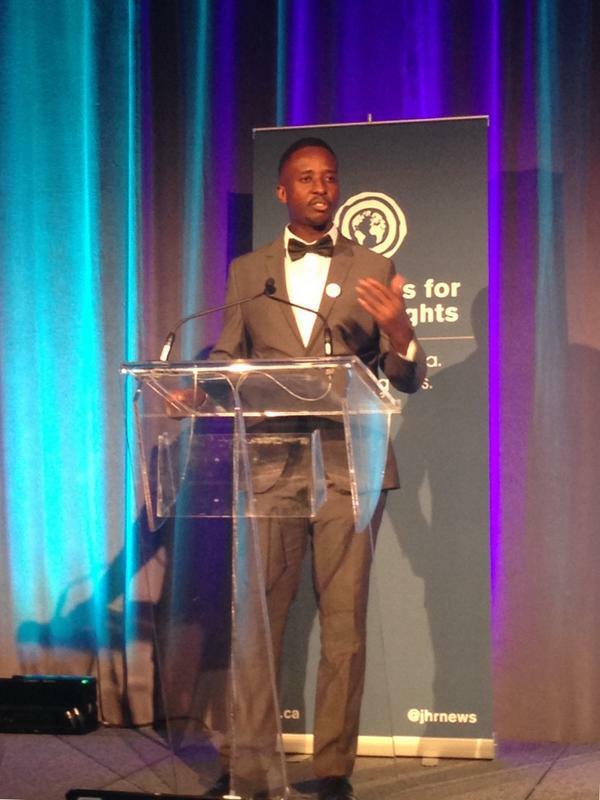 He is the Night for Rights co-chair..
LaFlamme said if we ignore human rights issues across the world, "we ignore them at our own peril." Ujiri, who grew up in Africa, says it's important to have voices overseas. Glamorous stories don't need to be told. Abducted girls, raped women, child soldiers are the ones who need their stories told. "We need to focus on the good stories influencing the bad stories," says Ujiri. "Africa is going to be one of the greatest continents in the world. I don't think it will happen in my lifetime, but it will happen," says Ujiri in an emotional speech. 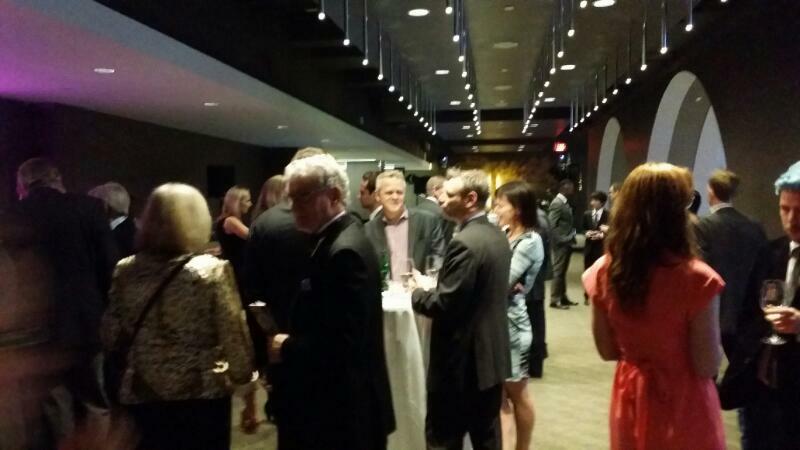 A quick break for dinner before the keynote speaker takes the stage. In a video highlighting JHR directors across the globe, speakers talk about the need for free speech and public information is often overlooked. Journalism in Jordan is not a good shape. There's censorship, lack of training, no place to do a certain kind of work. 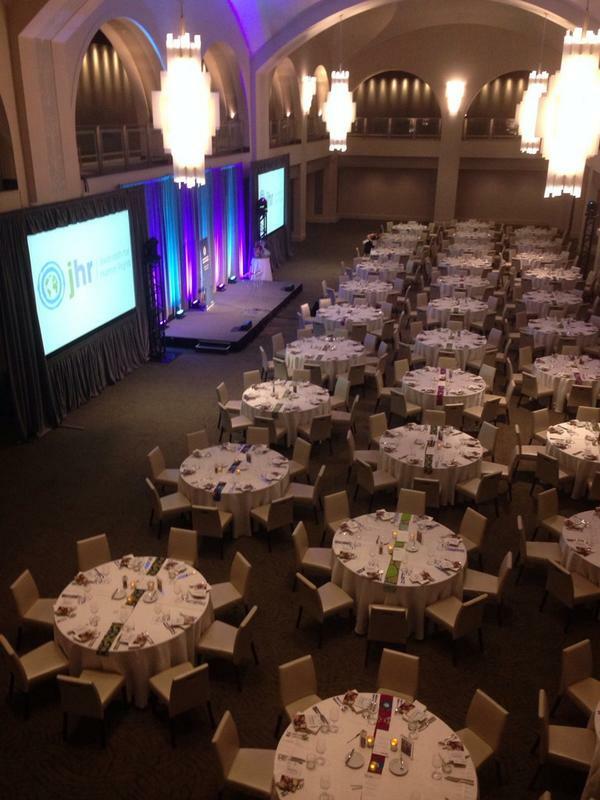 JHR helps create that space. Hanadi Gharaibeh takes the stage to talk about JHR in Jordan. Gharaibeh presents Maidan, an application to help human rights reporting across the globe. The keynote speaker, Sammy Awami, addresses the crowd. Awami talks about young female brides, circumcised and forced into marriage, broke his heart. He decided to become a journalist to tell their stories. Last year Awami was reminded about the power of the media last year, when he wrote about 400 girls who were about to undergo female genital mutilation. Awami's story touched the UN, who vowed to fight for this issue. "I saw how the voices of the media can create change," says Awami. There are always people barring the media from reporting information. One of the investigative papers was banner indefinitely, others were banned temporarily for covering human rights issues.